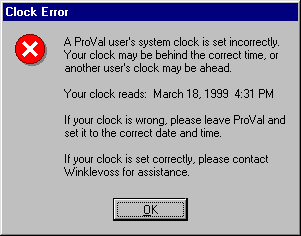 A “Clock Error” Message pops up when trying to work in ProVal. Someone at the site has an incorrectly set clock. Either another user’s clock is (or was) set in the future, or the current user’s clock is set in the past. Be sure to check the AM/PM settings!